Steven Spielberg’s docudrama The Post is a riveting one that hits on a few different subjects. Set in 1971 against the backdrop of protests against the Vietnam War, an embattled Nixon administration, recent assassinations linked to the Civil Rights struggle, the film documents the true story of the leaking of the classified “Pentagon Papers” to the press – a decades long documentation and study spanning four administrations and both political parties, starting with Eisenhauer, of how the government intervened in Vietnam, started a war and lied to the American public about its intentions there and its chances of winning any war. The other thread in The Post is the then one-sided rivalry between heralded national newspaper The New York Times and what was, at the time, a small local paper, which had struggled for years to expand its market, profitability, and crawl out of the shadow of its big rival in New York. The Washington Post, from which the film takes its name, is at the center of the film’s narrative. We enter the story when Kay Graham (Meryl Streep) inherits her family business after her husband commits suicide, making her the first woman to head a major newspaper. She is met with both skepticism and curiosity and she is also unsure of herself at first. Her editor Ben Bradlee (Tom Hanks) – a hardnosed newspaper man – wants desperately to make the paper a respectable national competitor. The pressure is on when Mrs. Graham decides to take the paper public and the bankers become skittish over what is to be the big news story they have an opportunity to publish – the Pentagon Papers. The New York Times are the first to publish, getting the leaked documents from a government contractor and whistle blower Dan Ellsberg (Matthew Rhys), but a sample of the documents soon arrive at the Post as well. They locate Ellsberg and find he has thousands of copies of pages from report dating all the way back to the 1950s that he slipped out of his firm a little at a time. Now The Post is in a dilemma – the Nixon administration came down hard on the press, and when the Times published their stories on the Pentagon Papers, they sued, resulting in a Federal Court injunction against publication. Kay Graham, new in her position, friendly with Robert McNamara (Bruce Greenwood) who commissioned pat of the study, and still trying to gain respect as a publisher has to decide if she will allow Ben Bradlee to go ahead and publish, thereby risking not only their stock offering, but a potential felony. And there is the third thread of the film – an exploration of the First Amendment issues that the case brought up. The New York Times and The Washington Post would both eventually go on to argue their case in front of the Supreme Court and win, setting a precedent that still holds today, making it legal for the press to release information leaked to them even if the leakers obtained it by illegal means. “[a free] press was to serve the governed, not the governors”. Spielberg effortlessly weaves together these different threads into an intense thriller of sorts, although he does let his penchant for melodrama get in the way at times. This only saved by a wonderful performance by Meryl Streep who brilliantly portrays Kay Graham as she navigates the testosterone-heavy world of the newspaper men after being jarred from her life as a well-to-do mother, housewife, and socialite. That she begins her reign atop The Washington Post empire feeling the need to defer to the men around her who don’t even own her company is telling of the time, but one can witness her growing confidence and need to define herself as an individual in Streep’s performance. What The Post fails to do is go beyond the surface of the things it is discussing – why The Pentagon Papers were so important, why Kay Graham is such a remarkable figure and so on. It touches on these things in only the broadest terms. Still, it holds your attention from the opening and keeps it right up to its conclusion and its powerhouse cast are firing on all cylinders. L-R: Tom Hanks (Ben Bradlee), David Cross (Howard Simons), John Rue (Gene Patterson), Bob Odenkirk (Ben Bagdikian), Jessie Mueller (Judith Martin), and Philip Casnoff (Chalmers Roberts) in Twentieth Century Fox’s THE POST. Photo Credit: Niko Tavernise. The Post was shot on medium and fast speed 35mm Kodak Vision3 200T 5213 and Vision3 500T 5219 film stock in the 3-perf Super 35 format on the Panavision Panaflex Millennium XL2 with Panavision Primo, PVintage, and PCZ lenses. A 4K DI (Digital Intermediate) was used in post-processing and the film comes to 4K Ultra HD in an HEVC 2160p (4K) encodement with HDR (High Dynamic Range) mastering in the HDR10 format mastered at a maximum of 1000 nits and a minimum of 0.005 nits. Having a rather desaturated color pallet, this isn’t a film that’s going to dazzle and the film grain structure can sometimes look just a little touch gritty, but it always looks natural and organic. The HDR does help the imagery come alive, however, with beautiful highlights like an amber-colored lamp light in the corner of a dimly lit room. The 4K Ultra HD and Blu-ray Discs come with a DTS-HD Master Audio 7.1 mix of the film. They aren’t quite as immersive as Atmos or DTS:X, but they are exceptionally done with lots of solid effects in the surround and surround back channels, lush atmospherics, and clear dialogue. John Williams’ powerful score is wonderfully balanced into all and there lots of headroom with no clipping to be heard anywhere. The collection for special features are a solid set of historical reference and “making of” featurettes with interviews and behind-the-scenes footage. The Post can feel at times a little too melodramatic, but it holds your attention from beginning to end. All though the ending is a bit of pandering, this is a satisfying docudrama that looks beautiful in this 4K Ultra HD release. 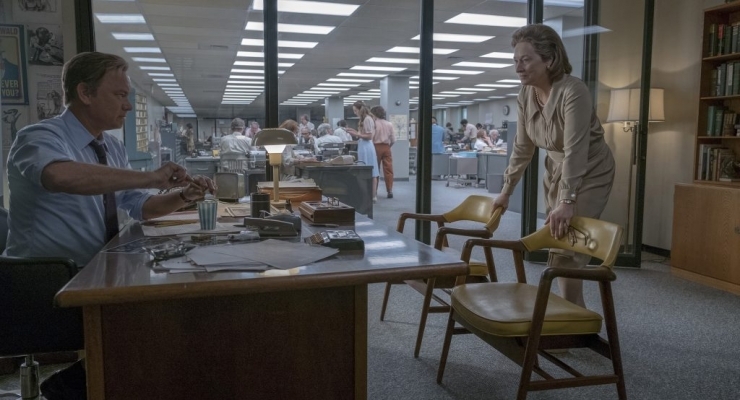 In 1971 against the backdrop of swelling protests against the Vietnam War, violent Civil Rights clashes, and turmoil in the Nixon administration, Kay Graham (Meryl Streep) inherits her family's struggling local newspaper, The Washington Post, becoming the first woman to head a large publishing firm, just as the Pentagon Papers -- documents exposing four administrations' and two political parties' coverups and lies to the American people about Vietnam. Now she and her editor Bill Bradlee (Tom Hanks) must decide if they should publish the papers, risk breaking the law, and take their battle against a hostile government all the way to the nation's top court. 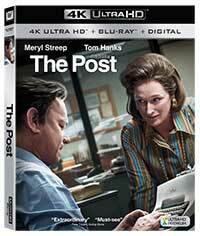 Spielberg crafts a sometimes melodramatic, but constantly suspenseful and gripping documdrama in The Post. The 4K Ultra HD Blu-ray looks wholly satisfying.